Back to school and the fall season mean potlucks, classroom celebrations… and trying to figure out which kids are eating gluten-free. 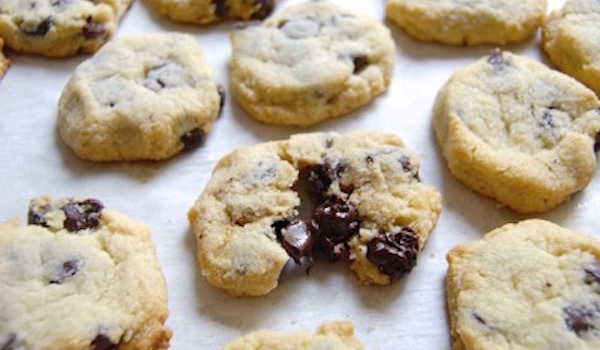 These chocolate chip cookies are a treat everyone can enjoy — gluten-free or not. Thankfully, you don’t need all kinds of specialty ingredients to make these cookies: no tapioca starch, rice flour, or xanthan gum. Simple, healthy almond flour (made from finely ground almonds) forms a tender, tasty base for the usual chocolate chip cookie ingredients: butter and sugar, salt and vanilla, and — of course! — chocolate chips. First, preheat your oven to 350°F with a rack in the center. Lightly grease a baking sheet, or line it with parchment. Get out a medium-sized mixing bowl. 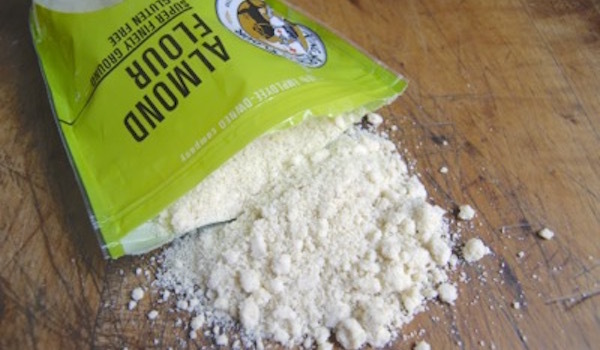 Measure into it 1 cup of almond flour, 3 tablespoons softened butter, 3 tablespoons confectioners’ sugar, 1/8 teaspoon salt, and 1 teaspoon vanilla extract. 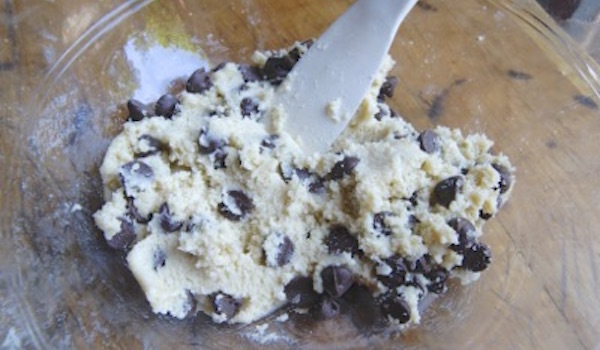 Mix until everything is well blended and cohesive, then stir in 1/2 cup chocolate chips. 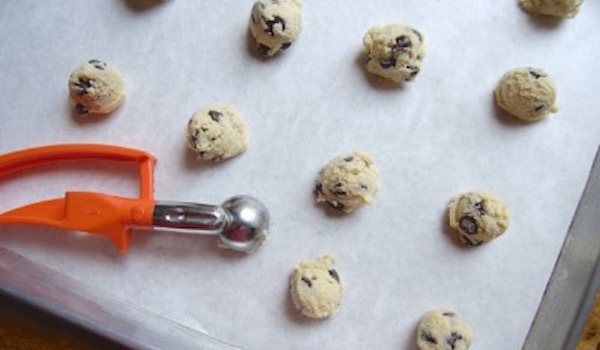 Scoop the cookie dough in generous 1” balls onto the prepared baking sheet. A small ice cream scoop works well here. You can position the cookies quite close together, as pictured; they won’t spread much as they bake. Using the bottom of a measuring cup or drinking glass, flatten the cookies to 1/4” thick. Sprinkling a little bit of sugar atop each cookie helps keep the glass from sticking. Bake the cookies for about 10 minutes, until they’re starting to brown around the edges. Remove them from the oven, and let them cool right on the pan. Enjoy! Everyone loves a warm chocolate chip cookie, but these are equally good at room temperature. The subtle nuttiness of the almond flour pairs wonderfully with the chocolate chips — and a glass of cold milk or cup of coffee. 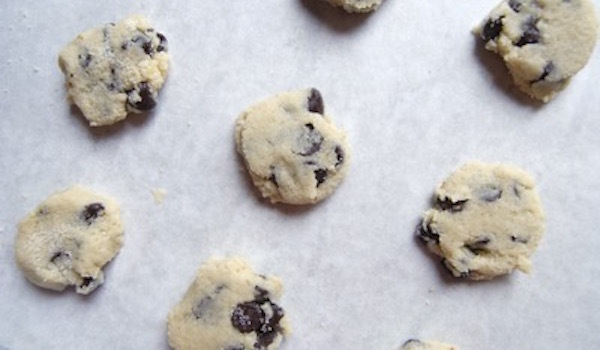 This recipe makes 18 cookies; it’s easily doubled if you’re feeding a crowd.